Hano​i (VNA) – Forty young Hanoians are going to carry out voluntary activities in Vientiane, Laos, as an illustration of the youth’s efforts to nurture the friendship between Vietnam and Laos. 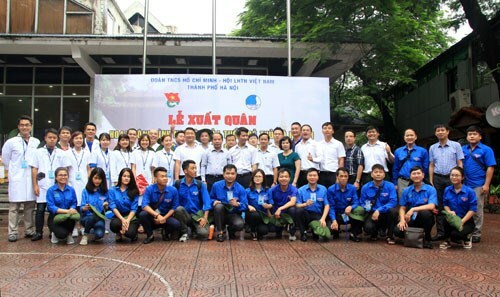 The Hanoi municipal committee of the Ho Chi Minh Communist Youth Union (CYU) and the Hanoi Youth Federation launched the voluntary campaign in the capital city of Vietnam on August 15. The campaign is held amid the 55th anniversary of Vietnam-Laos diplomatic ties, 40 years of the signing of the countries’ Treaty of Friendship and Cooperation, and 20 years of the singing of a cooperation and friendship agreement between the Hanoi CYU Committee and the Vientiane municipal committee of the Lao People’s Revolutionary Youth Union. The 40 volunteers are doctors, nurses, experts in livestock farming and outstanding university students in Hanoi. During the 10-day campaign in Sikhottabong district of Vientiane, they are set to give free medical check-ups and medicine to 1,500 people, instruct locals to prevent diseases and accidents, and transfer livestock farming techniques. They will also visit disadvantaged families, take part in cultural and sports activities with local residents, and present computers and learning and sports equipment to young people in Vientiane.